Kameron Hurley is an award-winning author and advertising copywriter. Hurley grew up in Washington State, and has lived in Fairbanks, Alaska; Durban, South Africa; and Chicago. She has a degree in historical studies from the University of Alaska and a Master’s in History from the University of Kwa-Zulu Natal, specializing in the history of South African resistance movements. Her essay on the history of women in conflict“We Have Always Fought” was the first blog post to win a Hugo Award. It was also nominated for Best Non-Fiction work by the British Fantasy Society. Hurley is the author of God’s War, Infidel, and Rapture, a science-fantasy noir series which earned her the Sydney J. Bounds Award for Best Newcomer and the Kitschy Award for Best Debut Novel. Her latest novel, The Mirror Empire is published by Angry Robot Books. 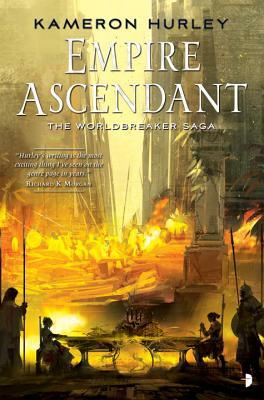 and the sequel, Empire Ascendant, will be out in October 2015. Her first space opera, The Stars are Legion, will be published from Simon and Schuster’s Saga imprint in fall of 2016. She has won the Hugo Award twice, and been a finalist for the Arthur C. Clarke Award, Nebula Award, the Locus Award and the BSFA Award for Best Novel. Additionally, her work has been included on the Tiptree Award Honor List and been long-listed for the Gemmell Morningstar Award. Hurley’s short fiction has appeared in magazines such as Lightspeed, EscapePod, and Strange Horizons, and anthologies such as The Lowest Heaven, The Mammoth Book of SF Stories by Women,Year’s Best SF and the upcoming Meeting Infinity. Her work has been translated into Romanian, Swedish, German, Hebrew, Chinese, Spanish and Russian. She is also a graduate of Clarion West, and writes regular columns for Locus Magazine. In addition to her writing, Hurley has been a Stollee guest lecturer at Buena Vista University and taught copywriting at the School of Advertising Art. Hurley currently lives in Ohio, where she’s cultivating an urban homestead. "Hurley reuses old tropes to excellent effect, interweaving them with original elements to create a world that will fascinate and delight her established fans and appeal to newcomers. Readers will blaze through this opening installment and eagerly await the promised sequel." "This is a hugely ambitious work, bloody and violent, with interestingly gender-flipped politics and a host of factions to keep straight, as points of view switch often. Although it is a challenging read, the strong narrative thread in this new series from Hurley (God's War) pulls readers through the imaginative tangle of multiple worlds and histories colliding." "With vividly inventive world building and a fast-paced plot, The Mirror Empire opens a smart, brutal, and ambitious epic fantasy series. Book two is already on my must-read list." "There's a powerful yet elegant brutality in The Mirror Empire that serves notice to traditional epic fantasy: move over, make way, an intoxicating new blend of storytelling has arrived. These are pages that will command your attention." "The Mirror Empire is the most original fantasy I’ve read in a long time, set in a world full of new ideas, expanding the horizons of the genre. A complex and intricate book full of elegant ideas and finely-drawn characters." "Yes, it’s dark, and yes, it can be a difficult, layered, complex read (call it graduate-level fantasy). But it’s so unlike a lot of epic fantasy out there. Heck, it’s unlike a lot of grimdark out there too. I mean, how many grimdark novels do you know deal with issues of gender fluidity and consent? For some readers, this review may add up to a catalog of reasons not to read this series. And I realize that many readers might bounce off this book. But they would be missing out on some of the most ambitious, original fantasy I’ve read in a long time." "For me it did all the things a fantasy should do -- holding our own societies up to the light by reflecting off worlds that are very different. Add in a magic system where the users are only powerful some of the time, and semi sentient vegetation that is possibly more of a threat than the magic users, and I happily sank into this book with a satisfied sigh."